It’s impossible to understand the taste and style of Memphis barbecue without first understanding the background of the city. Memphis was founded in 1819 on the banks of the Mississippi River by a group of investors that included James Winchester, John Overton and Andrew Jackson. They named it in honor of the ancient capital of Egypt on the Nile River. The location made the city a prime spot for shipping cotton and lumber, especially during the Civil War. In 1873, 1878 and 1879, the city was hit with yellow fever epidemics that caused the vast majority of the population to die or flee. As a result, Memphis lost its city charter and was merely a tax district until 1893 when the charter was restored. In more modern times, Memphis became a center for blues and rock music. Muddy Waters, B.B. King and Elvis all lived or worked in Memphis at some point in their careers. It could be these extremes in styles of music that brought on the intense flavor of the pork only barbecue. It will never do to ask for beef barbecue in Memphis. In Memphis, the secret to the barbecue actually begins with the dry rub. The recipes vary and are closely guarded secrets in many locally owned restaurants, but they are generally paprika based with some sweet heat added along with salt. A dry rub is exactly what it sounds like, and it is literally rubbed all over the pork before it is slow roasted over an oak fire. It’s important to note that, unlike other parts of the country, Memphis barbecue is strictly made from ribs or pork shoulder, and is sometimes chopped and served with a vinegar-based slaw on top. Don’t believe for a moment that dry rub equals dry meat. The slow cooking process creates moist meat that is so tender it will literally melt in a diner’s mouth, and the unique red color the meat gains while cooking is from the liberal amounts of paprika in the rub. 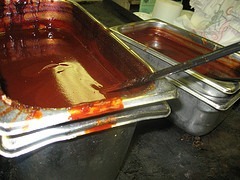 In Memphis, ribs are served with just the rub or what is known as “dry” or “wet” with sauce on top or on the side. 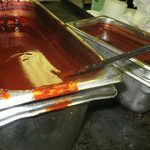 Sauces in Memphis are also closely guarded secrets, but they are usually a combination of vinegar, tomato sauce and brown sugar. There are some basic recipes for rub and sauce that are shared here. They lack the sometimes 48 ingredients some local rib joints claim they put in their creations, but they will offer an approximation of the Memphis style. Mix all ingredients in an air tight container. Rub the pork generously with the mixture and store any leftovers in the airtight container. Melt butter in a saucepan or in the microwave. Add onion and garlic and saute until lightly browned. Add remaining ingredients, making sure to add the vinegar last. Reduce heat and simmer over low for 20 minutes. Allow to cool. This sauce can be placed in a food processor to create a smoother barbecue sauce. Now it will be easy to create a slow-cooked Memphis barbecue feast in the backyard this summer. Slather the ribs or pork shoulder with the rub and serve the sauce so guests can decide whether to have them wet or dry. Either way, it will be a treat.